கருணாநிதி விலகினால் என்ன, நாங்கள் ஆதரிக்கிறோம் – முல்லாயம்! கருணாநிதி–காங்கிரஸ் நாடகம் ஏன்? : காங்கிரஸ்-திமுக நாடகத்தை ஆங்கில ஊடகங்கள் நன்றாகவே வெளிப்படுத்தியுள்ளன. குல்லா போட்டு கஞ்சி குடித்தவர்களின் நாடகம் நன்றாகவே வெளிப்பட்டு விட்டது. “பர்ஸ்ட் போஸ்ட்” என்ற இணைத்தளம் எப்படி மணித்துளிகளாக நாடகம் அரங்கேறியுள்ளது என்பதனைக் காட்டியுள்ளது. The Samajwadi Party has said it will continue supporting the UPA and dismissed DMK chief Karunanidhi’s announcement that the DMK was pulling out of the alliance, as a mere threat. “The DMK has not given any letter to the President. This is all just a show” said senior SP leader Ram Gopal Yadav to media. ஐக்கிய நாடுகள் சபை ஓட்டெடுப்பிற்கு முன்பாக பார்லிமென்ட் ஏதாவது தீர்மானம் நிறைவேற்றினால் நாங்கள் மறுபரிசீலினை செய்வோம் (Will reconsider if Parliament passes resolution ahead of UN vote: DMK ): அமெரிக்காவின் தீர்மானத்தை ஆதரிப்பதில், UPA ஏதாவது செய்தால், திமுக அமைதியாகி விடும், ராஜினாமா புஸ்ஸாகி விடும் என்ற கருத்தும் நிலவுகிறது. மார்ச் 22 அன்று தீர்மானம், ஓட்டளிப்பற்கு வருவதால், திமுக இத்தகைய நாடகத்தை அரங்கேற்றியுள்ளதாக மற்ற கூட்டணி கட்சிகள் கூறுகின்றன. 6.16 pm: DMK MP S Ganapathy says that the party didn’t withdraw support to pull down the UPA govt, but was acting according to the will of the people of TN. 5.40 pm: Government sources say that the DMK never insisted on the term ‘genocide’ during their meet with the Congress leaders. “They sought a resolution in Indian Parliament and demanded amendments to the UN resolution on Lanka,” they add. 4.40 pm: DMK sticks to its three demands on the resolution on Sri Lanka. It insists that the terms ‘genocide’ and ‘war crimes’ be included in the US-backed resolution. It also demands an international probe into the alleged war crimes by Sri Lankan Army against Lankan Tamils during the almost three decade long conflict with LTTE cadres. 4.07 pm: Government sources that the UPA managers are in touch with the DMK and trying to convince them to give up on the inclusion of the term ‘genocide’ in the US-backed UN resolution against Sri Lanka. The sources add that the term ‘genocide’ can be used in diplomatic parlance only after an international probe. 3:09pm: Amendment in UNHCR resolution on Sri Lanka to be moved by India. The amendment will make the resolution more stringent. But no decision has been taken on inclusion of the word “genocide”. The resolution in Parliament will be moved only if there is consensus and the government is speaking to all political parties. 2:22 pm: Trinamool Congress (TMC) will back DMK on Sri Lanka Tamil issue. “The UPA has no moral right to govern, it is a minority government. TMC will back parliamentary resolution if it comes. TMC won’t object to the word genocide either. If there’s a race for PM, Mamata is our PM candidate. No NDA, no UPA, we will go alone in the polls,” says TMC MP Sultan Ahmed. 2:06 pm: Parliamentary Affairs Minister Kamal Nath: We are ready to discuss the Sri Lankan Tamil issue. The process of consultation is on. 2:04 pm: Rajya Sabha adjourned till Wednesday. 2:03 pm: Kamal Nath in Lok Sabha: There’s no last date for India to take a position. We are open to discussion. In the Rajya Sabha MPs demand a resolution on Sri Lanka, raise slogans “we want justice”. 2:02 pm: Uproar in Rajya Sabha over Sri Lanka issue. 1:56 pm: Tamil Nadu Chief Minister and AIADMK chief J Jayalalithaa calls DMK pullout from UPA “a drama”. 1:50 pm: TMC says regional parties will play a larger role in the coming elections. The UPA has no moral right to govern and TMC is ready for early elections, says the party. 1:41 pm: Kamal Nath: I am confident there will be convergence with Karunanidhi. We are yet to take a call on the resolution. The decision on calling an all-party meeting only after the government has decided. The government has numbers and there is no threat to it. 1:04 pm: DMK Rajya Sabha MP Vasanthi Stanley says that the window of negotiation with the UPA is still open. “We are not here to destabilise the government, we are sure government will look at our demand. There is no divorce from the UPA, only an attempt to explain our position,” says Vasanthi. She also added that DMK was serious about withdrawing the support. “Our leader has given a statement earlier. As for submitting a letter to the President, if required that will also be done,” she said. 12:53 pm: DMK calls for an emergency executive committee meeting on March 25. 12:42 pm: “The DMK has still not sent the letter to the President, so the party hasn’t withdrawn support. We will continue to support the UPA government,” says Samajwadi Party Rajya Sabha MP Ram Gopal Yadav. 12:39 pm: The Cabinet Committee on Security to meet at 4.20 pm. Likely to take up Sri Lanka Tamil issue. 12:34 pm Sources say BJP is not in favour of a country specific resolution. The language of the resolution should avoid words like “genocide” and instead “human rights violation” is acceptable to the party, says sources. 12:23 pm: Lok Sabha adjourned till 2 pm amidst uproar. 12:23 pm: Parliamentary Affairs Minister Kamal Nath: The government is concerned about the developments in Sri Lanka, the government is ready for discussion in the House. 12:22 pm “There is a statement being circulated about the majority of the government in the Lok Sabha,” says BJP MP Yashwant Sinha. 12:22 pm The resolution has failed to fulfill the aspirations of the Tamil people, says DMK. 12:20 pm: Government sources say that informal consultations are going on with Opposition parties and the UPA has been working on a resolution on Sri Lanka Tamils issue. Sources say the UPA is confident that DMK will reconsider support and add that they are hopeful of solution within next 24 hours. 12:19 pm: “Tamil Nadu is burning. Every section of the society is on the streets. I am speaking on behalf of the DMK,” says TKS Elangovan. 12:18 pm: What is the government stand on Sri Lanka? If the government is not giving a suggestion on resolution, it will not be incorporated,” says M Thambi Durai of the AIADMK. 12:17 pm: M Thambi Durai of the AIADMK says the House should pass a strong resolution. 12:14 pm: Rajya Sabha adjourned till 2 pm after uproar over Sri Lanka. 12:01 pm: Lok Sabha resumes, uproar over Sri Lanka war crimes continues. 11:57 am: NCP leader Praful Patel says there is no desire of the DMK to cause instability. “Theirs is a genuine concern for people of Tamil Nadu. The DMK, I am told, will reconsider its stand if Parliament passes a resolution. Let’s not read too much into it,” says Patel. 11:50 am: Finance Minister P Chidambaram says that according to media the DMK President has said that he will reconsider his decision depending on the resolution. He says consultations have begun on the resolution on Sri Lanka. “Karunanidhi is a senior leader and we have taken note of his statement. We respect his statement. DMK’s requests are under consideration,” he adds. 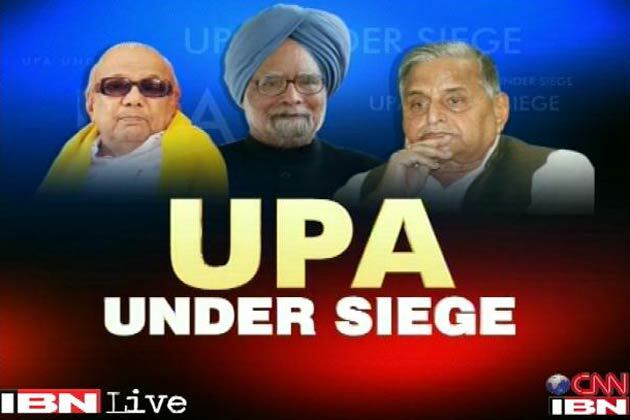 11:44 am: The UPA could call all-party meet to decide on Sri Lanka resolution. 11:22 am: If the government passes a resolution in Parliament before Friday (March 21) condemning the Sri Lankan government, DMK is willing to reconsider its decision. The DMK ministers will resign today or tomorrow. The Centre is not doing enough for the Tamil cause, says Karunanidhi. 11:19 am: DMK has reiterated its demand to the Central Government yesterday also, says Karunanidhi. 11:17 am: DMK is pulling out in of UPA completely. Do not see any point in giving outside support, says Karunanidhi. 11:16 am: Inspite of all the DMK requests, Centre has not done anything. Karunanidhi. 11:15 am: In complete support of the revolution in Sri Lanka and the rights of the Tamils, we have fought for their rights: Karunanidhi. 11:13 am: DMK salutes all those who have lost their lives and all those who are protesting against Sri Lankan war crimes: Karunanidhi. 11:12 am: Sri Lanka has committed serious crimes. The DMK has always condemned these crimes, says Karunanidhi. 11:12 am: DMK has always worked for the Tamils, says Karunanidhi. 11:10 am: DMK ministers will resign and DMK has decided to pull out of the UPA alliance. 11:01 am: Sources say DMK ministers are likely to resign soon to protest against alleged war crimes in Sri Lanka. The DMK has five ministers in the Union Cabinet. 10:43 am: “We are in the process of looking at the various proposals coming to us. We will decide on it. The draft we have received is a work in progress. We are conscious of the aspirations, some have explicit positions, others still formulating their position. We are engaged with all stake holders,” says External Affairs Minister Salman Khurshid. 10:34 am A revised version of the draft accessed by Amnesty from the UNHRC intranet is a watered down version of the original. The draft ‘Encourages’ rather than ‘Urges’ Sri Lanka to accept an independent international probe. The revised draft inserts a para ‘Welcomes Sri Lankan work in rehabilitation of war-displaced Tamils’. It calls on ‘respective states’ rather than ‘Government of Sri Lanka’ to implement recommendations. The revised draft makes mention of new evidence of human rights violations, but imposes no new conditions on Sri Lanka. This is not the final final version of the resolution which will be voted and there could be more revisions. 10:06 am: We strongly stand for human rights, says Congress President Sonia Gandhi on Sri Lanka Tamils issue. Sonia told a meeting of the Congress Parliamentary Party that India is fully committed to protecting the rights of Tamils who have been attacked. But Sonia stopped short of committing to DMK chief M Karunanidhi’s demand. 9:47 am: DMK has given a notice for suspension of question hour in both houses: Rajya Sabha MP Tiruchi Siva. Standing firm on its stand for a very strong resolution against Sri Lanka in the United Nation Human Rights Council (UNHRC), the DMK has decided to stall both houses of Parliament on Tuesday to force the Congress-led UPA Government to vote in favour of the US-sponsored resolution. DMK leaders have given a notice for suspension of question hour in both houses of Parliament. “India should intervene and see that the resolution is strengthened but we understand that the resolution is further diluted. We think the the UNHRC resolution has become irrelevant and we want the Government of India to intervene and see that Tamils are protected in the Island. We are going to raise the issue in the Parliament today,” said DMK MP TKS Elangovan. The government is walking a tightrope after the DMK threatened to pull its ministers out of the Union Cabinet and may consider extending outside support to the government. There are several important bills pending and the Centre is worried that India-Sri Lanka ties will be hit if the government takes a strong stand on the resolution. Government sources, however, claim that there is not much to worry as the DMK would be placated soon. On the other hand the DMK feels that it has little to lose as Lok Sabha are just about a year away and if the party takes a strong stand on the alleged war crimes by the Sri Lanka forces during the war against the LTTE, it can bounce back in Tamil Nadu. The DMK has been on the backfoot after losing to the AIADMK in the Tamil Nadu assembly elections. Congress leaders P Chidambaram, AK Antony and Ghulam Nabi Azad had on Monday met M Karunanidhi at his residence in the evening to sort matters out after the latter threatened to pull out his ministers from the UPA Cabinet if his demands on the issues were not met. Karunanidhi, as well as his political rival, Tamil Nadu Chief Minister J Jayalalithaa, have been demanding amendments to the UN resolution against Sri Lanka. The two parties, the DMK and the AIADMK, have been demanding that India vote in favour of the resolution. They have also demanded introduction of the words ‘Eelam’ and ‘genocide’ in the US-sponsored resolution. They have also asked for an international probe into the matter. The government had hoped that voting against Sri Lanka at the UN Human Rights council in Geneva would be enough, but the DMK chief wants more. 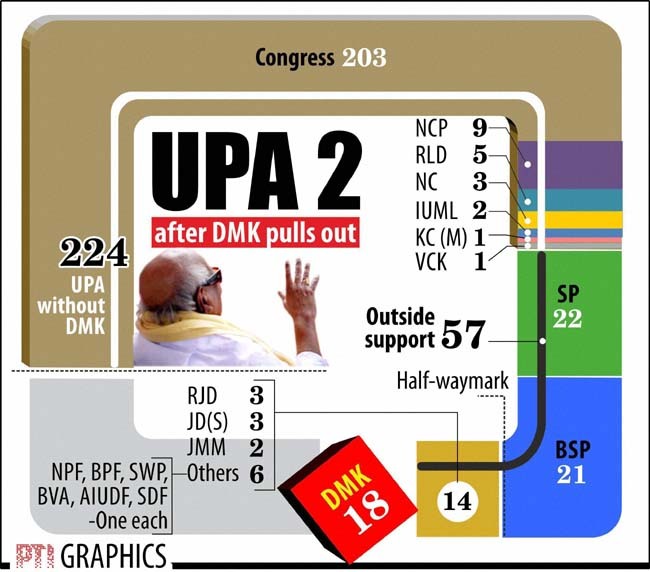 Sources now say that the DMK is likely to offer outside support to the UPA. However, they add that the party has not yet decided on pulling out from the government. A decision is likely to be taken after a party meet, they say. “Genocide must be included. It must be a tougher resolution,” Karunanidhi said. In Delhi, government said India’s Representative to the UN in Geneva will be in the national capital on Tuesday for consultations and a call will be taken after studying the final draft of the resolution. “The resolution in its final form will be available late this evening, Geneva time. The Foreign Secretary has also asked our Permanent Representative to the UN Dilip Sinha to come over to Delhi tomorrow,” External Affairs Ministry spokesperson told reporters. But diplomats say the government’s domestic compulsions must be balanced with diplomatic commitments. India has traditionally opposed such harsh language and international interference from the UN, and wants to avoid another strain in ties with Colombo. Karunanidhi had on Sunday said he felt ‘let down’ by the ‘lukewarm’ response of the Centre.